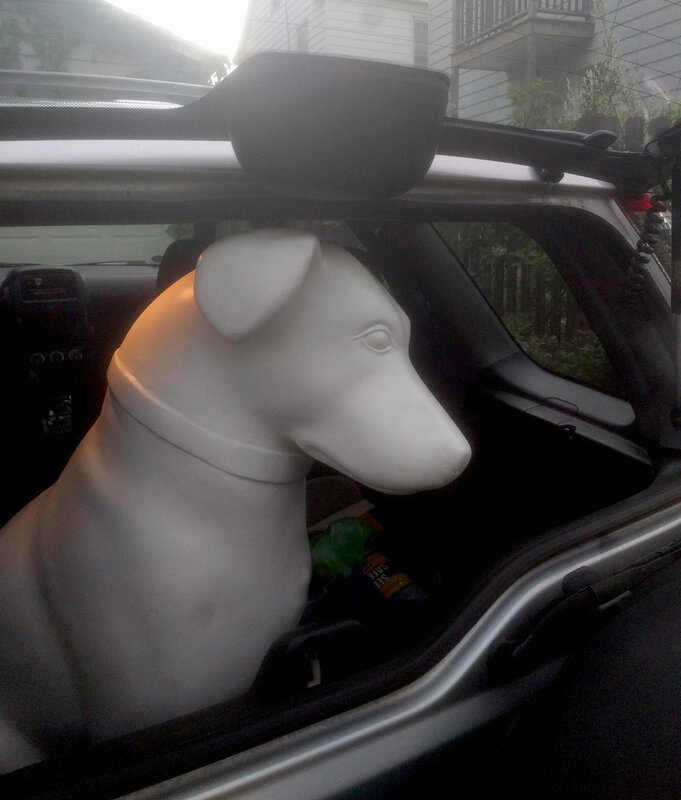 Last spring (2017), I was fortunate enough to be selected from a large pool of local artists to work on an artistic reinterpretation of the iconic Nipper statue in Albany, NY. Originally 10 artists were selected, but due to popular demand the project was expanded to a second wave. Each statue was placed in a unique location throughout Downtown Albany, where it sat and watched over each neighborhood for almost 18 months! 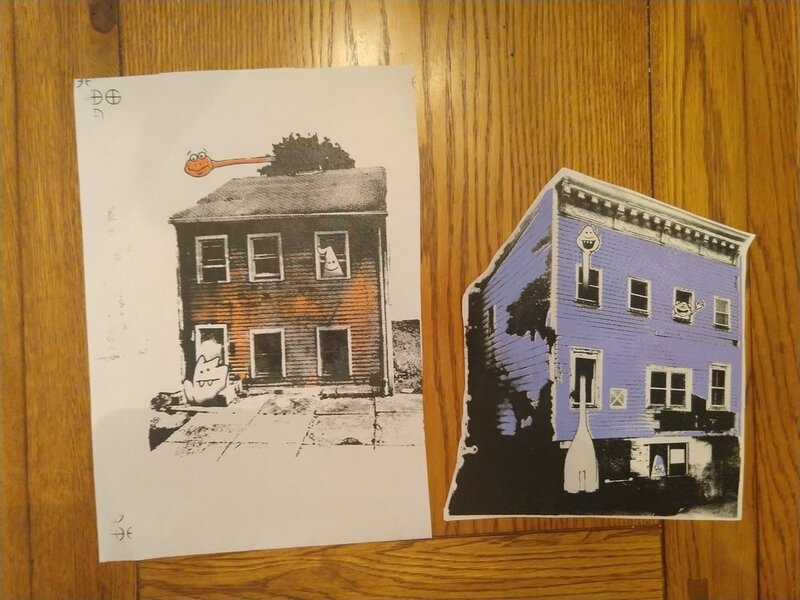 For my sculpture, I decided that the Nipper sculpture was the perfect canvas to continue my screen-print series, New Neighbors. 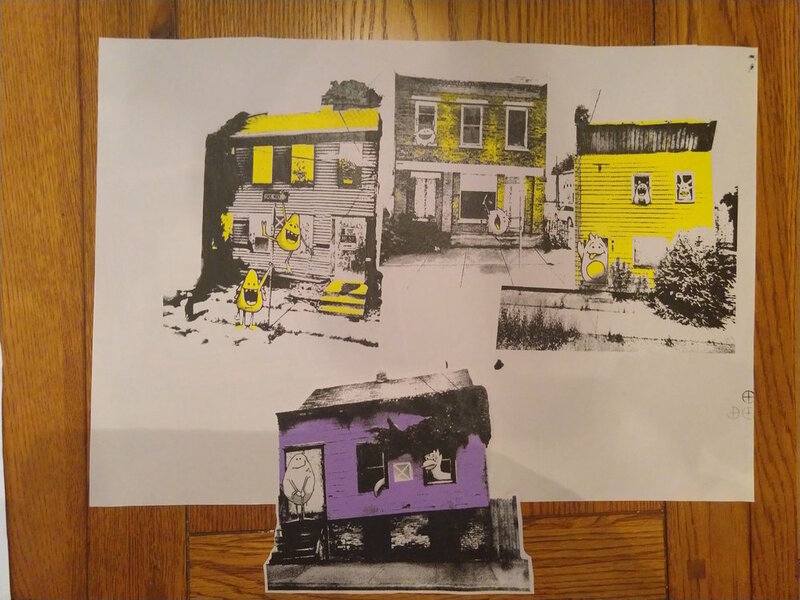 Originally started a singular show as part of the Breathing Lights, the New Neighbors is a series of prints that highlights abandoned buildings and properties throughout the city of Albany. In each print, a family of creatures from all walks of life has moved into the building. 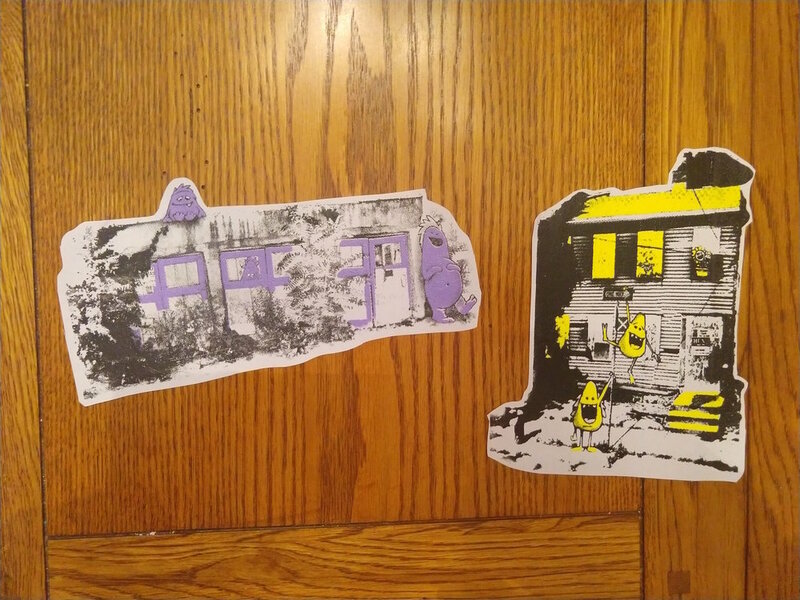 The series is a whimsical, fun series intended to highlight the abandonment issue in the city of Albany, while encouraging us all to rethink what these buildings could hold in the future of the city. Sketching out characters on the photographs. I almost always forget to document my work, but for New Neighbor Ned, I made sure to snap a few process pictures a long the way. Ned is comprised of over 20 different screen-prints collaged over his body. 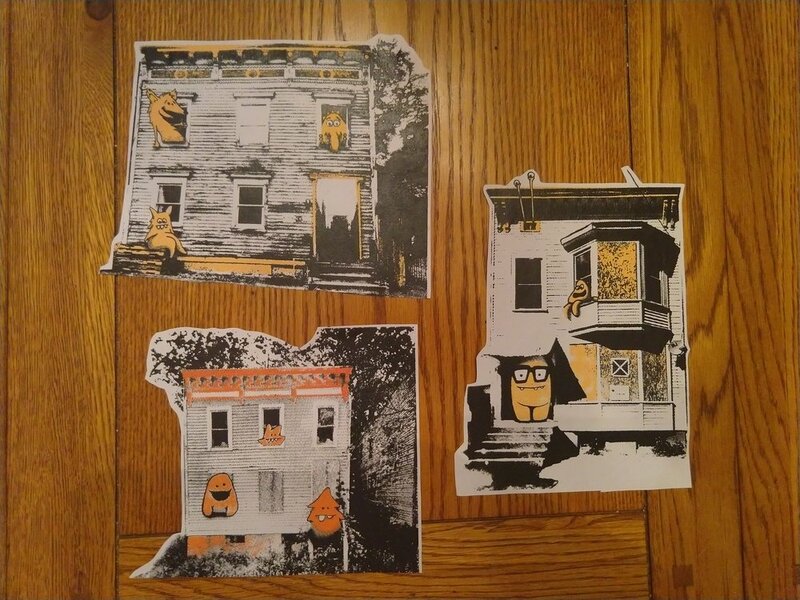 Each print originated as a photo that I superimposed the “New Neighbors” characters into. 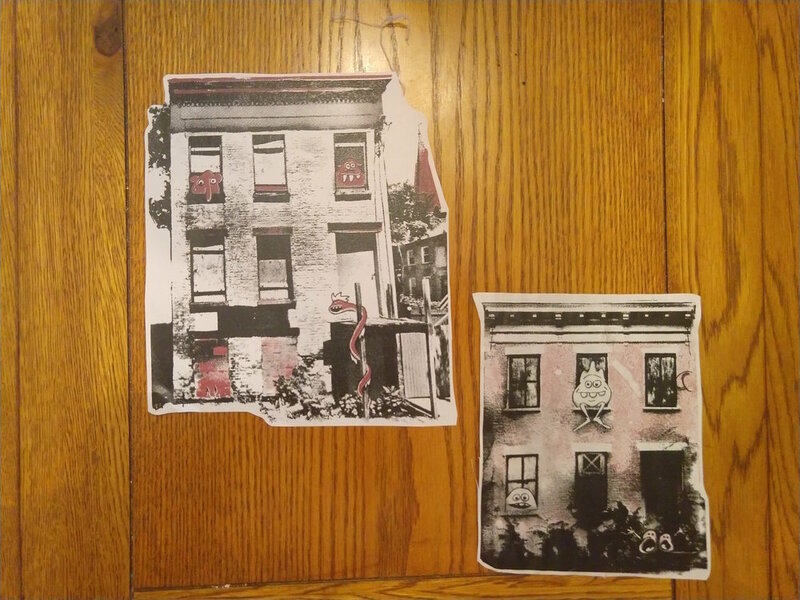 Then each photograph was stylized for screen printing, separated into two colors and printed on newsprint. 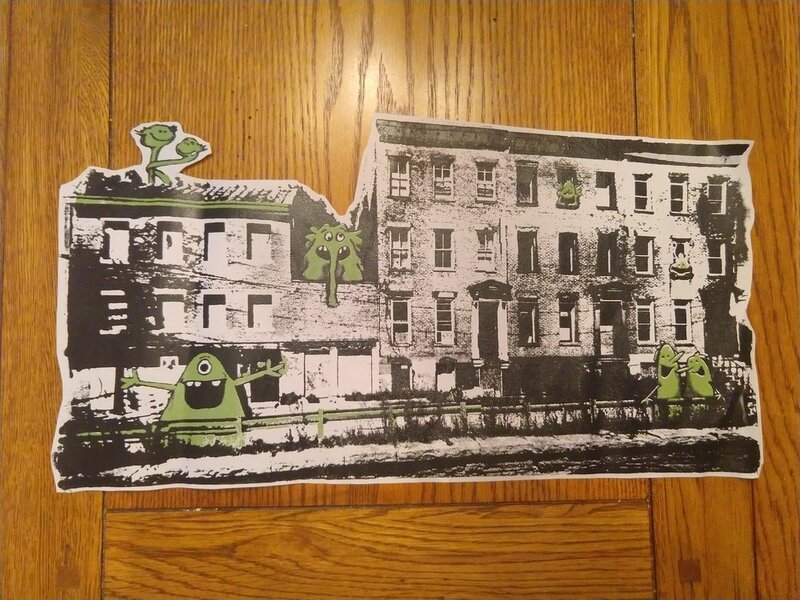 Each print was wheat-pasted and collaged together on Ned, creating a new neighborhood of friendly faces! All of the dogs that were a part of Downtown is Pawesome will be auctioned off at the Downtown is Pawesome Auction event in Albany. It should be a really fun event and I am excited to see all the sculptures together in one place! Limited tickets are still available here. Portions of all the auctions/sales go to the Mohawk Hudson Humane Society!